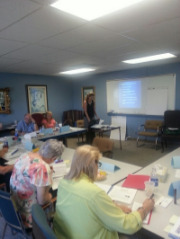 This past weekend, I co-facilitated a Leadership Academy for the first time. It was a great experience. The Leadership Academy is an exemplary training program designed for peer, family and parent leaders in mental health recovery. The Academy is an educational training program for those who are eager to strengthen their leadership, networking and advocacy skills. The Academy focuses on creating system and community changes through collective self-determination, which exemplifies empowerment. I originally attended the Academy myself back in May 2013 and completed the train the trainer program in October 2013. Due to funding, the Florida Academies were delayed until recently. So, FINALLY, this past weekend, my co-facilitator, Laura Gribble, and I conducted the first Leadership Academy in our region. We had a great group of individuals, who participated in the three-day training. The participants want to make a difference in their lives and the lives of others. The Leadership Academy began in Idaho in an effort to increase consumer involvement within the behavioral health system and communities. The program expanded and in May 2013, the first Florida Leadership Academy was held. The Florida Leadership Academy is sponsored by CLEAR (Connecting Leadership, Education, Advocacy and Recovery), a statewide program of NAMI of Collier County and the state of Florida's Department of Children and Families, who overseas mental health services in the state of Florida. Despite being a little "rusty" on the material since it was 2 years ago since I attended the original academy, the weekend training went well. Laura and I successfully graduated 12 individuals, who are now going to be even more effective in advocacy within their communities. I am honored to have been a part of the training and I look forward to co-facilitating the next one.